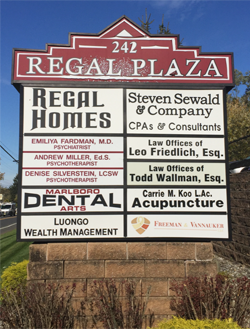 As a dentist in Morganville, with an established reputation for excellence, we take great pride in offering a comprehensive range of dental services and providing our patients with the latest advances in care. If you are looking for a dentist in Morganville, who can provide high quality and affordable dental care that will meet the needs of every member of your family, give us a call today. We accept many insurance plans and offer flexible financing options so that our patients can begin treatment without any added delays. This remarkable technique requires only 4 implants in either the upper or lower jaw to support all the replacement teeth for that dental arch. All-on-4® typically involves only one surgery to place all the implants, avoids the need for additional bone grafting procedures, and provides the instant gratification of receiving a full set of temporary teeth immediately on the same day as the initial procedure. Dr. Rossi graduated from New York University College of Dentistry in 1997. He then went on to complete a general practice residency at Staten Island University Hospital. Dr. Rossi is a member of the American Dental Association as well as The Academy of General Dentistry. Dr. Rossi has been in private practice for 21 years specializing in all aspects of general dentistry. Dr. DiLeo graduated from New York University College of Dentistry in 1997. She then went on to complete a general practice residency at Staten Island University Hospital. Dr. DiLeo is a member of the American Dental Association. Dr. DiLeo has been in private practice for 21 years specializing in all aspects of general dentistry.